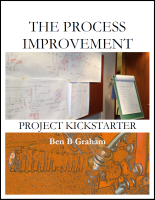 The Process Improvement Project Kickstarter is a pdf document formatted for double-sided printing. It includes the first three sections of the Process Improvement Project Guide: Define the Project, Get Everybody on Board, and Collect the Facts. It also includes the Project Definition Checklist, the Data Collection Checklist, and the Project Definition Agreement. I hope this Kickstarter helps you get a great start on your next project.